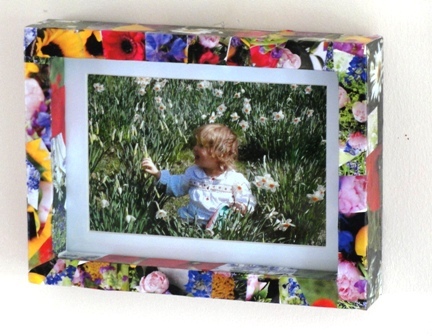 Last week I came across a selection of picture frames that I'd bought for displaying family photos. 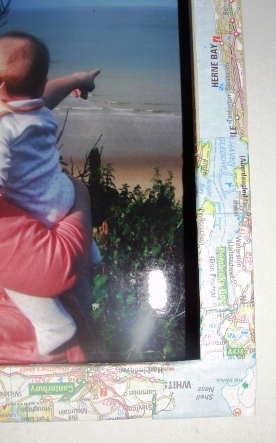 Sadly one had become damaged, but as I watched Minnie cutting & sticking with her scrapbook I had an idea. 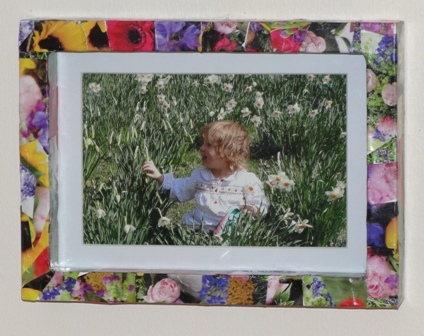 How about a decoupage style frame. 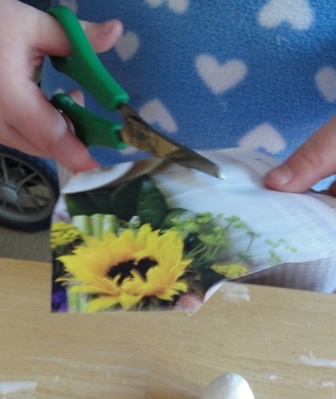 I've seen some beautiful decoupage sheets to buy, but with a little hunting around we found some frugal alternatives. 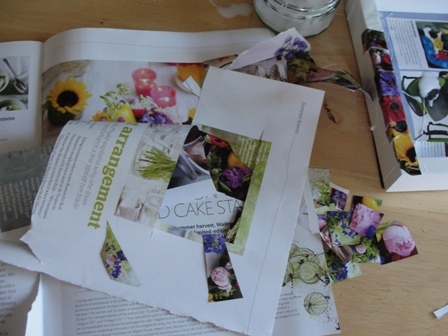 We collected some old magazines, fliers, junk mail & got stuck in with our scissors. 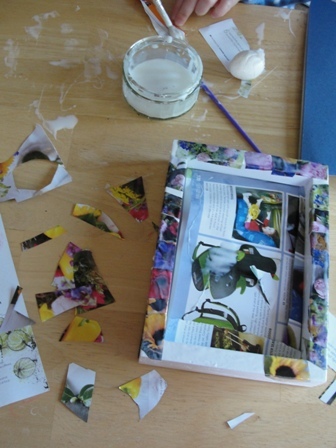 Minnie wanted to make a flower frame so we cut up as many floral pics as we could find. 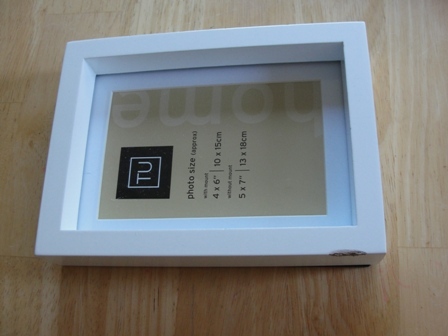 We cut the paper into small square-ish shapes to fit easily across the frame. 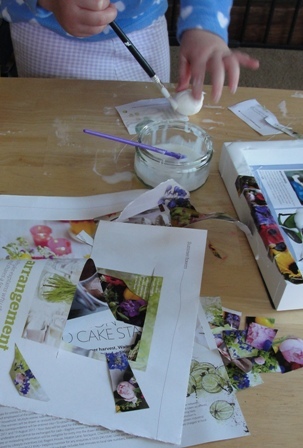 Minnie had a great time applying the paper & spreading the glue here, there & everywhere. The great thing with the gloopy glue (PVA/Mod podge) is that it dries clear, so it doesn't matter how much is applied (luckily). Minnie decorated this frame over 2 days. 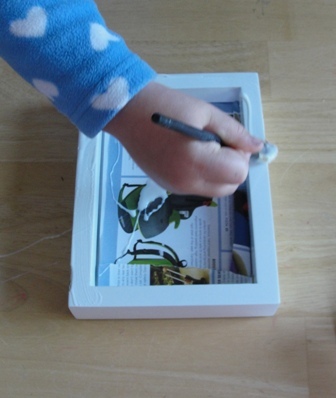 When she had applied all the paper she covered the whole frame with the gloopy glue, which when dry would create a glossy finish. We left to dry over night, before adding our photo. 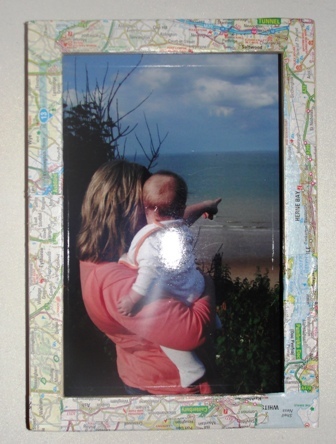 Or you could use leaflets/adverts from places/attractions you visited on your holiday, making a perfect frame for your holiday snaps. 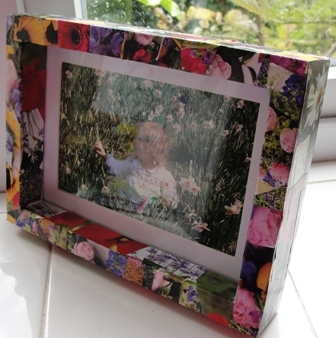 And if you don't have a photo frame at hand, a simple alternative is to use a cereal box cut into a frame shape. A frugal, fun activity, which also makes a beautiful unique gift!